Asia Pacific Arts: Honestly: Eric Nam in San Francisco ” and “Don’t Call Me,” two songs off his latest album Honestly, Eric set the tone of the show: light and fun. The audience erupted into cheers as he took the stage performing Latin-tinged “Potion” with his backup dancers before taking command of the stage alone for “Don’t Call Me,” beckoning the crowd to jump along with him. Diving into tracks from earlier in his career, Eric turned up the sweetness and serenaded the audience with pop R&B ballads “Interview” and “Good For You,” while, of course, picking a lucky fan to specially receive a rose. Seeing Eric Nam live in concert felt like hanging out with a friend, but one with super smooth vocals and a winning smile. Chatting with the crowd, Eric pointed out all the silly signs fans lovingly made of him and shared stories from his days as an intern living in San Francisco. Living in the Mission, he reminisced eating late night pupusas and that one time he passed out on a bus after a long night before being woken up by a cop and running off terrified. Sounded like some fans could relate, as laughter echoed in the venue. Although the hall was packed with people, Eric easily connected with the audience and developed a playful rapport that lasted the whole show through. The latter half of the show focused on Eric’s latest collaborations with other artists such as “Idea of You” with Arty, “Body” with Timbaland, “Into You” with KOLAJ. Eric’s recent music ventures into a more electro pop sound that have revealed another side to the singer, as he seemed to let loose and work the stage more freely. With more chill songs like “Cave Me In,” he really vitalized its lulling melody with inflections of emotion through his soothing voice, naturally inspiring listeners to waving their phones to the swaying rhythm. Fans attending the tour also got the special treat of hearing Eric’s to-be-released song “Float,” which will be featured as part of the soundtrack for upcoming animated American film Transylvania Hotel 3. Closing the show with two encore songs “Honestly” and “Can’t Help Myself,” Eric had fun with the audience throwing in a quick dance tutorial and a silly dance break that had the crowd screaming. From start to finish, Eric had the entire venue buzzing with energy, eager for what’s next and disappointed for the end. Later, he tweeted a recap video of the night with the caption, “I need to come back to San Francisco. Too much fun." San Francisco certainly felt the same and is more than ready for his return. 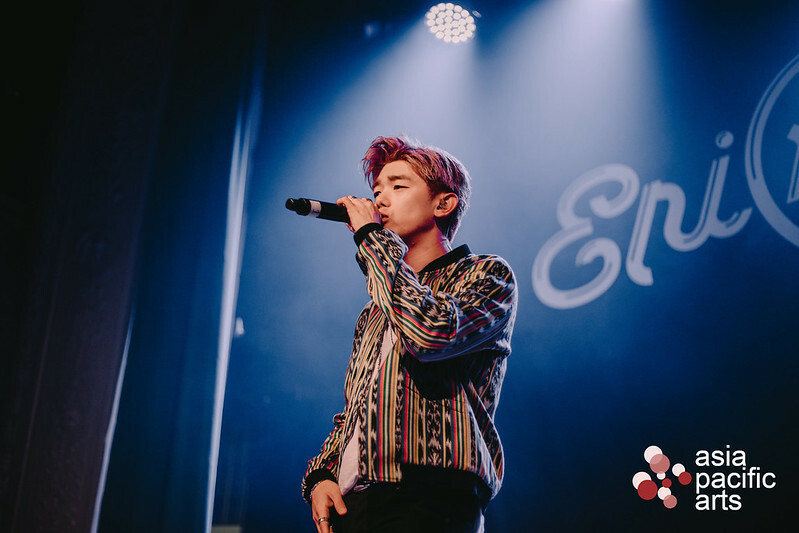 Check out our photos below from Eric Nam's show in San Francisco!